This is the book to use when looking for a descriptive or technical term or when you know the subject or meaning but not the specific word. 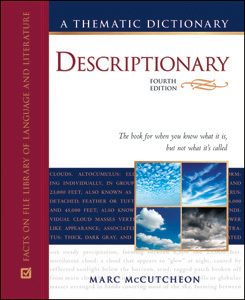 Descriptionary, Fourth Edition is a clever combination of a reverse dictionary and a thesaurus, with thousands of descriptions of terms organized into subject categories and sub-categories. This edition contains thousands of descriptions of terms organized into expanded and updated sections, including those on politics and the Internet, and dozens of new sections. Many new finance and technology terms have also been added to this user-friendly book. "...a useful addition to a writer's tool box."